Helen asked, in comments to my last post, if I should consider a miniskirt. I had, in a highly delusional moment, considered just chopping off a quarter of a yard off of each pattern piece and making a miniskirt wrap, before thinking about it rationally and buying the extra yard. This was so stupid. I should have lopped off the pattern pieces. The night I wrote my last post, I also decided to do some basic sewing and hemming of the main pieces. The next night, I put almost everything together, but left it unhemmed on the very bottom. This led me to a horrible realization. This skirt was way way way way too long on me. It covered my knees, even with the hemming calculated in, by a good amount. I decided to do what I did not want to do. After showing it to Helen, who pointed out that it would be the perfect length for her, I decided to chop it severely. I took six and a half inches off of the bottom of the skirt. Then, last night, I hemmed the whole sucker up. It's really hard to see the pattern in my full pic, so I included a little pic of it. I love this skirt. 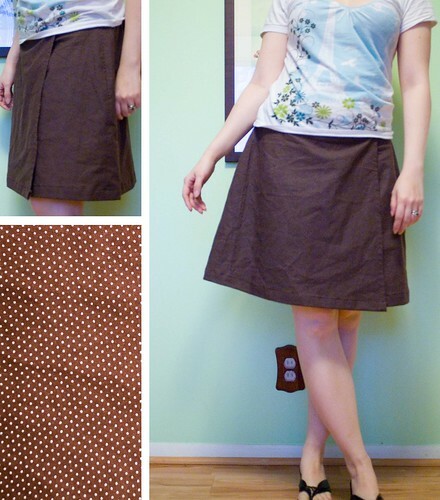 It's a great summer skirt, and one that works well with my collection of tanks and tees. It's adorable and perfect for casual wear. I am always wearing jeans in the summer and that is sometimes way too hot. Now I have this skirt to wear as well! I call this project a complete success. On to my next sewing project now! What should it be? Pillowcases? Curtains for Nathan's room? wield those scissors with impunity! It looks super cute now! Oh my goodness, that is soooo cute! Awesome job! Thank you for the comments, guys! I'm heartened to hear that you all like it. I'm really psyched to do more sewing now, too! How Goes The Plan, Stan? My Epic Fail -- Sewing Edition!